Summertime is usually the time of the year when television takes a break. There is little fanfair and little new programming that is showing. However, there is one new show that is worth checking out (if you haven’t already). That show is Halt and Catch Fire on Sunday nights at 9:00pm Eastern (8:00pm Central) on AMC. AMC was once known as “American Movie Classics” but in recent times has become a place for original TV shows. Their track record of shows includes Walking Dead and Breaking Bad. I will admit though that I have never seen one episode of either show (gasp!). But from hearing from my friends how great those shows are, there was a lot to live up to for Halt and Catch Fire especially airing on Sunday nights. The show is set in 1983 Texas (and has that retro feel that brings back those memories even for those that were kids in the 80s). It centers around computers and the rise of the PC (personal computer) in those early years. A fictional company named Cardiff Electric based in Texas is the place and the man who has a vision to see the company revolutionize the PC market is Joe MacMillian. Joe is played by Lee Pace, who is best known for his work on the TV show Pushing Daisies and is set to appear in Marvel’s Guardians of the Galaxy in August. Joe is a former player at IBM who jumped ship and seemingly crashed the party at Cardiff and kind of takes over a company that’s never produced a computer and pushes them to get in the PC market. Joe enlists the help of Gordon Clark, a sales guy at Cardiff who’s also a dreamer and computer designer in his own right (Gordon is played by Scoot McNairy who’s also had roles in Argo, Monsters), Marvel One-Shot: All Hail The King and announced to have a role in Batman v Superman: Dawn of Justice) and Cameron Howe (played by newcomer Mackensie Davis), who is an unemployed college student but is a tech whiz. Joe and Gordon are able to reverse engineer an IBM PC and in order to not get in trouble with the feds hire Cameron to Cardiff to develop without looking at IBM’s manuals. Easier said than done right? Well when you have Joe who’s only looking out for himself and will use anything (and anyone) to get to the top, Gordon who is insecure and stressed out to no end from work and tries to be a good husband to his wife Donna (played exceptionally well by Kerry Bishe, who has also been in Argo as well as the last season of Scrubs) and father to his children and Cameron who’s a genius but has her moments of not all being there, you have the perfect recipe for drama. The show’s title is a computer term that was an old instruction to PCs. It was fictional but what it would do is basically shut down the computer. It would be a race for each program to be the top program and would self destruct. It will be interesting to see how things turn out at Cardiff Electric. Will they be able to produce a revolutionary computer? Or will Joe bring down Gordon, Cameron and everyone at Cardiff Electric? The show is nearly at the halfway point of the first season. There’s still time to get into the show and get caught up on it. If you’re into computers, you enjoy all the tech talk. If you’re a fan of the 1980s, this show will bring back memories of Speak and Spells , boomboxes and Walkmans. Halt and Catch Fire is a great show to add to the list of shows that AMC has put out recently. 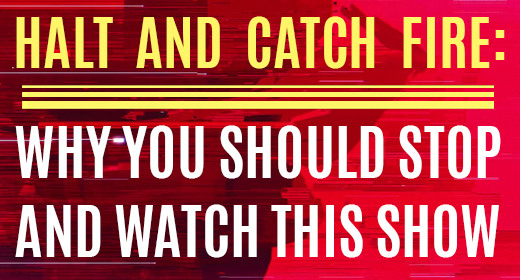 So on Sunday nights this summer, you should stop and watch Halt and Catch Fire.